The phrase “crowdsourcing” has been thrown around for the past couple of years. You might have even heard it called out in your marketing or even customer service meetings, but do you actually know what it means, and most importantly, are you able to employ crowdsourcing strategies in your company? Crowdsourcing is a portmanteau (combination of two words) of crowd and outsourcing. Crowdsourcing decentralizes (goodbye bureaucratic, organizational pyramid) by sourcing tasks performed by specific individuals, group of people, or a community through an open call for contributions. Unlike the blow horn effect, crowdsourcing goes after people that have a specific interest and skill-set for involvement. Wikipedia is a good example of crowdsourcing. Through an open-call, Wikipedia attracts and engages a specific type of person and group of people who contribute to Wikipedia knowledge. 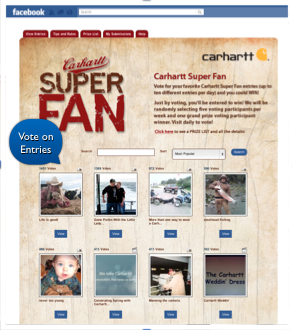 WhiteCloud Marketing, created a crowdsourcing Facebook campaign for Carhartt Inc.
Carhartt Inc., is a U.S.-based clothing company founded in 1889. It is still a family-owned company, owned by the descendants of company founder Hamilton Carhartt, with its headquarters in Dearborn, Michigan. 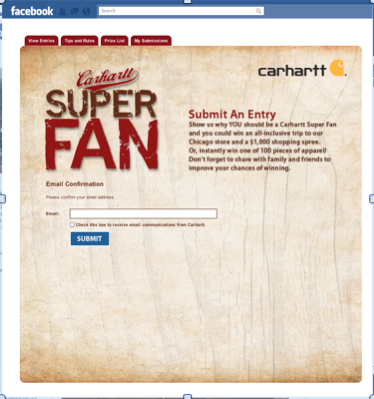 Carhartt approached us because they wanted to increase engagement on Facebook by increasing Likes and opt-ins. engagement and conversion rates for current customers (reminding them of the great benefits of the product, encouraging up-selling opportunities), while also bringing in new customers. Carhartt understands that customer re-engagement and new customer acquisition is possible on Facebook and other social networking sites. MavenSocial recommended a WhiteFire Social User Generated Campaign. Users could upload images or videos on how they have creatively used their clothing. Campaign users could then share their images with friends on Facebook, Twitter and via eMail. Every share provided an additional ballot to the user. Users were offered spot prizes for adding an entry and the top creative photos or videos were granted grand prizes. +Top 20 influencers brought in 8% of all the new email registrations. One influencer brought in 88 potential customers. people. The power of social media influencers, or Mavens is apparent, with a 219% WhiteFire Social Lift on sharing. Social lift is the amount of people that actively participate in the campaign, without the company paying for the direct marketing costs; in other words, these Likes and opt-ins were obtained free of charge for Carhartt. Carhartt’s social media Mavens are the people who shared Carhartt’s information amongst their friends; who in turn interacted with the campaign. One of Carhartt’s Mavens is one Influencer who brought in 88 potential customers. For proper brand engagement and consumer growth, it is important to respect and interact with your current consumer base, while finding new clients. Crowdsourcing benefits both the brand and the targeted group. The brand receives positive praise and re-engagement of past customers, which draws in news customers, and the target group receives products and services that desire. This past year, MavenSocial created a Facebook campaign for Carhartt Inc. We saw some amazing results, and thought that we would share it here. Social Media Influencers (Mavens) share avidly with their groups of friends, creating social lift. Now, why would Carhartt, a well-known staple in many a wardrobe, be worried about reaching people through social media outlets? They understand that there is a large potential market that can be reached through Facebook and other social networking sites. Twitter accounts at least once a day via their mobile phones. Haiges, explains “we knew that these sites are extremely popular for socializing, but the level of interest for branding and promotional marketing content is surprisingly large.” Social media outlets truly are becoming a powerful way to reach an otherwise untapped market. Facebook is coming out on top with 44% of online sharing occurring on Facebook. 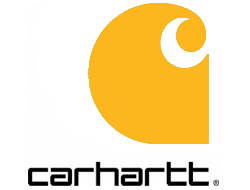 So what does this all mean for Carhartt? Carhartt knew that they wanted to actively engage a vast amount of people over Facebook; this is where we came in. 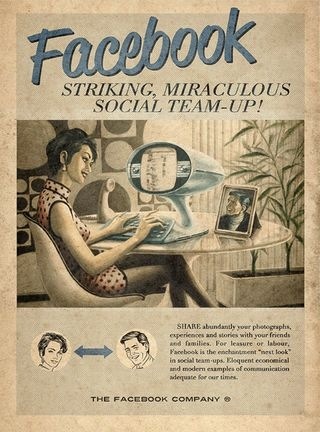 Facebook Campaigns encourage Sharing, identifying Social Infuencers (Mavens). MavenSocial recommended a User Generated Campaign. Users could upload images or videos on how they have creatively used their clothing. Campaign users could then share their images with friends on Facebook, Twitter and via eMail. Every share provided an additional ballot to the user. Users were offered spot prizes for adding an entry and the top creative photos or videos were granted grand prizes. We understood that the best way to engage with fans to increase Facebook Likes and opt-ins was through interaction with people. The power of social media influencers, or Mavens is apparent, with a 219% lift on sharing. Social lift is the amount of people that actively participate in the campaign, without the company paying for the direct marketing costs; in other words, these Likes and opt-ins were obtained free of charge for Carhartt. Carhartt’s social media Mavens are the people who shared Carhartt’s information amongst their friends; who in turn interacted with the campaign. An example of the campaign’s Maven would be one influencer who brought in 88 potential customers – now that’s great sharing!